Support for the Atmel SAM D21 Xplained Pro board. 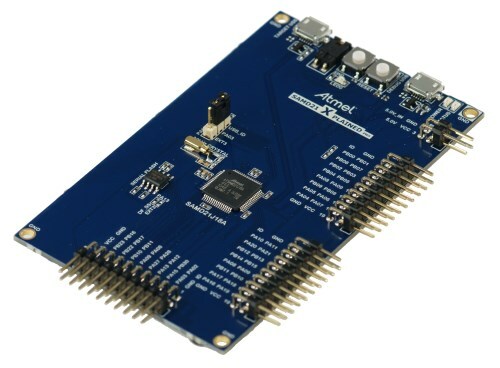 The SAMD21 Xplained Pro is an ultra-low power evaluation board by Atmel featuring an ATSAMD21J18A SoC. The SoC includes a SAMD21 ARM Cortex-M0+ micro- controller. For programming the MCU comes with 32Kb of RAM and 256Kb of flash memory. The samd21-xpro is available from various hardware vendors for ~30USD (as of 2017May). Connect the device to your Micro-USB cable using the port labeled as DEBUG USB. The standard method for flashing RIOT to the samd21-xpro is using OpenOCD. Refer to https://github.com/RIOT-OS/RIOT/wiki/OpenOCD for general instructions on building OpenOCD and make sure "cmsis-dap" and "hidapi-libusb" are enabled. # edit PKGBUILD, add "cmsis-dap hidapi-libusb" to "_features"
For using the samd21-xpro board we strongly recommend the usage of the GNU Tools for ARM Embedded Processors toolchain. Board specific definitions for the Atmel SAM D21 Xplained Pro board. Configuration of CPU peripherals for the Atmel SAM D21 Xplained Pro board.